After clicking on “Report a bug”, Google shows this message: “Please scroll until the issue becomes visible. 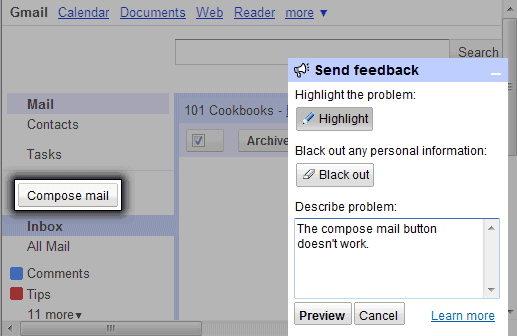 Next, click anywhere in the window to take a screenshot.” Click in the window and Gmail loads a new page that lets you highlight the problem, black out personal information and describe your problem. It’s a really cool feature which will probably be added to other Google services in the near future.